The apple orchards around us started opening up these last two weeks. I am so enjoying the first taste of fresh apples and cider. My family has already eaten TWO PECKS! The first week we had a bag of Paula Red's and we are just finishing some Ginger Gold's I picked up last week. I can't wait to see what is available this week. I found a fantastic apple crisp recipe in my new cookbook, The Vegetarian Mother's Cookbook by Cathe Olson. 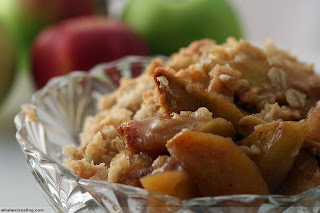 I have always loved apple crisp, but what I like about this particular recipe is all of the wholesome ingredients. It's still a dessert, but I don't feel quite so bad about enjoying it when it contains apples, oatmeal, maple syrup and other great foods. Give it a try this fall and enjoy! Preheat oven to 350 degrees. Lightly oil an 8 or 9 inch square baking dish. Toss apples with lemon juice, apple juice or water, sweetener, and cinnamon. Spread in bottom of pan. Mix oats, wheat germ, nuts, spices, and salt in food processor with metal blade or by hand. Heat butter or oil and mix with sweetener until smooth. Add to oat mixture and stir until completely combined. Cover apples with topping. Bake for 30 minutes or until golden. Serve with your choice of topping. *Another option instead of the ground nutmeg and cloves is to use 1 1/2 teaspoons of pumpkin pie spice. Variation: Use pears, peaches, plums, or a mixture of fruits instead of apples. I think I remember eating way too much of this at our Thanksgiving dinner because it was so good. I was actually just thinking of this recipe the other day because I was craving some caramely goodness, but then I was worried because I knew I would eat way too much again. Ha ha I think I'll take my chances. Thanks!